We shaked it! And then we shaked it ten times! News Anchor Brian Shawver “gets down” (literally) with a couple butter-makers. Will spring finally come!?? I would enjoy reading sitting outside under a tree as much as I do sitting inside by the fire! Tuesday, April 1 – Mrs. Bosworth will be at school to read, 9 AM. Thursday, April 3 – Mr. Lange will be at school to read, 9 AM. Don’t forget, NECAP Awards tonight! Tuesday, April 8 – Mrs. Bosworth will be at school to read, 9 AM. Thursday, April 10 – Ms. Erwin will be at school to read, 9 AM. Thursday, April 17 – Mr. Lange will be at school to read, 9 AM–We’ll be jumping today! Jump Rope for Hearts! Monday, April 21 – Friday April 25 No School! Vacation week! Don’t forget to check out some library books for vacation! Newspapers in Education — First Place Ads! 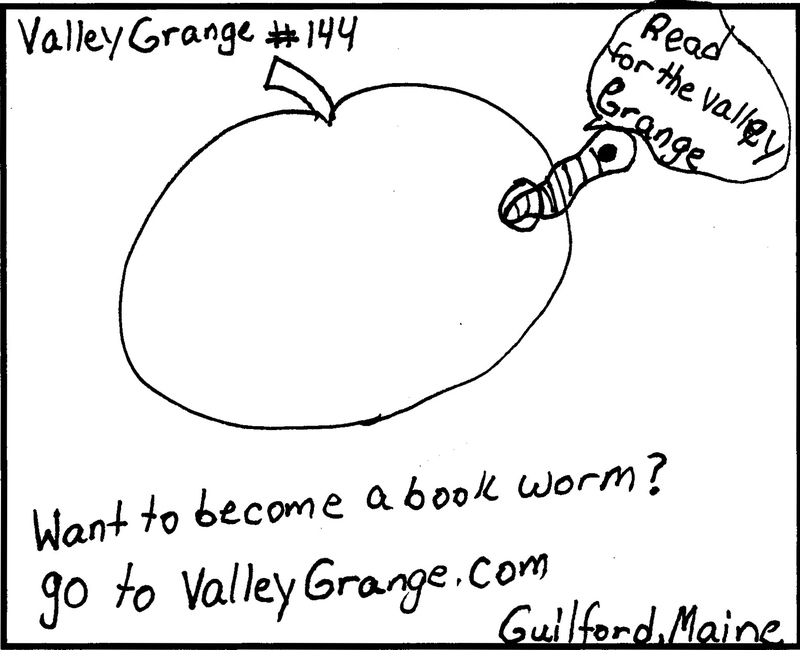 Don’t miss the Newspapers in Education Supplement in this week’s Piscataquis Observer–look for some stories about Valley Grange’s participation and find these two ads! The event is not just for people involved in GrowME—it is open to anyone who supports the idea of community and collaborating. The Grange promises to a “family friendly” event and hopes volunteers, teachers, kids, and parents will come. The “Plantastic Agstravaganza” features a community potluck supper at 6:00 PM—bring a dish to share! A brief meeting at 7 PM will cover some highlights of the GrowME collaboration and some agricultural related information. Attendees are invited to bring an old-time farm, gardening, or home device to display as part of “what is it?” table. Additional information is available on the GrowME website. 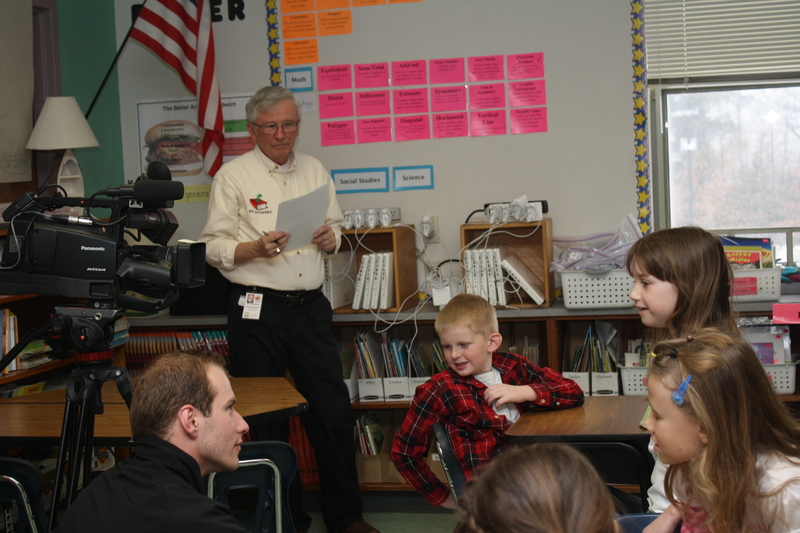 Valley Grange, well known for their partnerships and support of local elementary schools and students, has asked students to join in an effort to support troops stationed overseas by supporting the “Coups for Troops” program. The program was started in 2011 by Stephanie Almasy and several friends who were saving their families hundreds of dollars each month by clipping coupons. Almasy learned that military families overseas could use coupons at commissaries and she and her friends time sent coupons to twenty-six families. Just a few months later, over four hundred military families from over ten countries signed up for coupons and the program began growing geometrically. The Maine State Grange recently qualified as a satellite collection center where coupons are collected in bulk, then packaged and mailed directly to individual families overseas. Valley Grange Program Director Walter Boomsma says he was particularly impressed by the simplicity of the program. “This is what we might call a ‘no-brainer,’” Boomsma said. “The only requirement is an ability to use scissors!” Valley Grange members readily agreed and it wasn’t long before the idea of inviting the schools to help surfaced. “This couldn’t be much easier,” added Valley Grange Community Service Chairperson Mary Annis. “We don’t even need to worry about expiration dates—commissaries will accept coupons that have expired up to six months ago, so we have plenty of time to get them overseas.” The only coupons that can’t be accepted are those specific to stores. “We can take manufacturers coupons and ‘catalinas’ (coupons printed on the back of register tapes),” Annis explained. Additional information about the program is available at http://valleygrange.com. Coupons can also be brought to any Valley Grange meeting or given to a member of Valley Grange. Dr. Lesley Fernow writes a column called “Senior Matters” for the Piscataquis Observer in Dover Foxcroft. Valley Grange is privileged to have permission to use her past columns for our “Health Beat” Feature and for the information to be reposted to the Maine State Grange website. Address your questions or comments to lmf@fernowmedicalhousecalls.com, 207-992-6822. Please note that information is general in nature and specific questions should be addressed to your health care professional. How can you enjoy working out, eating local produce, and enhancing your total wellbeing affordably all summer? Garden! Gardening builds and strengthens muscles, providing full body exercise for people of all ages. An hour of steadily digging, weeding, and mulching is the equivalent of taking 10,000 steps! Enjoying ripe tomatoes and other fresh produce will double your rewards. Canning or freezing some of your crop will further extend the benefits of your labor well into the winter. Inviting a friend or young child to work with you may enrich your experience and socially engage your mind in ways that are known to protect against cognitive decline. While you’re in your garden, take care to plant some pumpkins. You’ll have homegrown jack-o-lanterns in the fall, and you can harvest the seeds. Pumpkin seeds are a “super food” containing high levels of fiber and protein. They may also contribute to prostate health, bone strength, and help to prevent arthritis. Blueberries are full of antioxidants that boost your immune system. Other foods you may want to grow in your garden that have crucial nutrients to prevent disease include garlic, broccoli, spinach, tomatoes, and onions.